Today I had an unusual situation with my Amazon account. 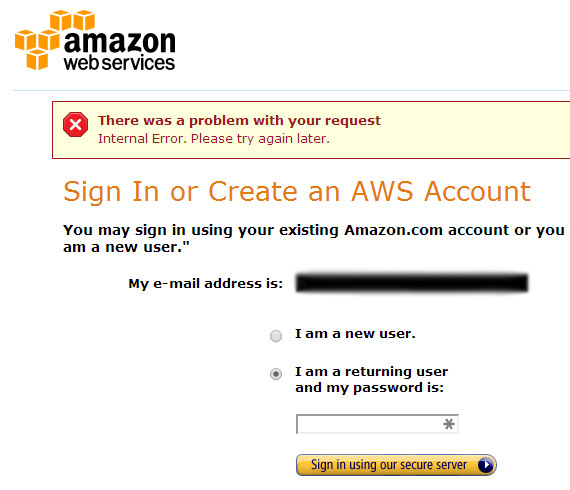 It started when I tried to log in to Amazon Web Services (AWS) to upload some files to my S3 account. Being the understanding user that I am, I waited awhile and tried again later as requested. Same problem. I went on to work on some other projects, but eventually came back to this because I really needed get the files into S3. Same problem. Initially, I tweeted my issue because I wondered if perhaps it might be affecting multiple users. There was no way to log in to the support site to post my issue… because I couldn’t log in! Ultimately, they called me as well, because I wasn’t able to get logged in to reply to the case ID that had been established for me. Tried to sign in using Firefox “Private Window” to eliminate the browser cache and any cookies that might be affecting sign-in. I actually busted out Internet Explorer (cringe!). Since this is a fairly recent install of Windows 7, I knew that I had never logged in to an Amazon account from IE, so that also gave me a fair test without the normal Amazon cookies and browser cache..
Used my wife’s laptop to try to sign in. In every case, I received the exact same error. One of the messages I received from AWS Support suggested that I attempt to login to another account. Although my AWS setup is all connected to my primary Amazon account, I did have another account or 2 that I could try. I was successful in logging in right away using the first account I tried. So…. I was able to conclude that the issue was directly connected to my Amazon account and didn’t have anything to do with my browser, cookies, or cache. Ultimately, after Nolan from Amazon Web Services Support got me on the phone, I walked him through all that I had done. He told me how puzzled they were on their end, since everything in my account looked OK. He first directed me to try to log in from a couple of specific locations, just to rule out user error (I’m guessing). After some effort, he asked if I would click the “Forgot Password” link. I guess it hadn’t occurred to me because I was too busy ruling out all sorts of other issues. So, I used the password reset function and created a new password. That’s when I did see a warning from Amazon’s site about cookies. I wish I had noted the actual error (or taken a screenshot of it). I didn’t. The error message seemed to indicate that my browser wasn’t accepting cookies (I was back in Chrome now, so I knew it was accepting cookies). At this point, I decided to go ahead and remove all Amazon cookies from Chrome. Once I did, I was able to login. Thank you, Amazon support! Thank you, Nolan! Apparently there was some corruption with my Amazon account on Amazon’s servers. I believe this because I saw the same error from every browser I tried to use—even from multiple machines. Apparently, the process for resetting my password cleared the issue! Bottom line: If you see this error, reset your password. You may also need to remove Amazon cookies from your browser. P.S. I was very impressed with the security procedures at Amazon. In every communication (I also tried to get support via chat), they took multiple steps to confirm my identity before proceeding. Kudos to them for establishing solid procedures for this!